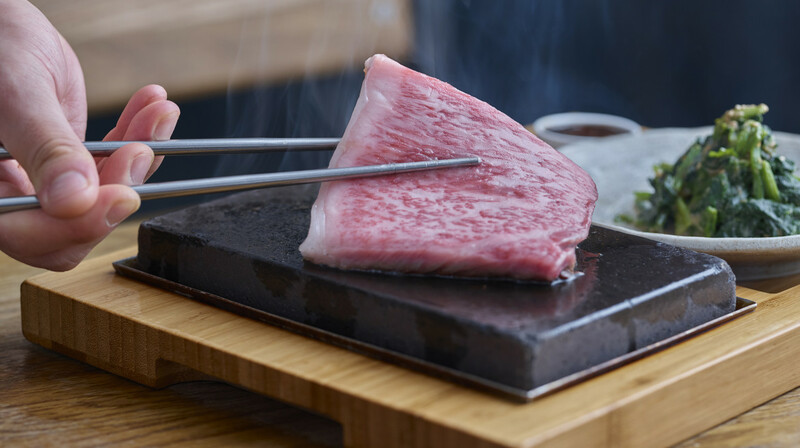 Head to this cool, contemporary Japanese restaurant to enjoy slithers of premium fish and wagyu beef seared on hot stones right at your table. 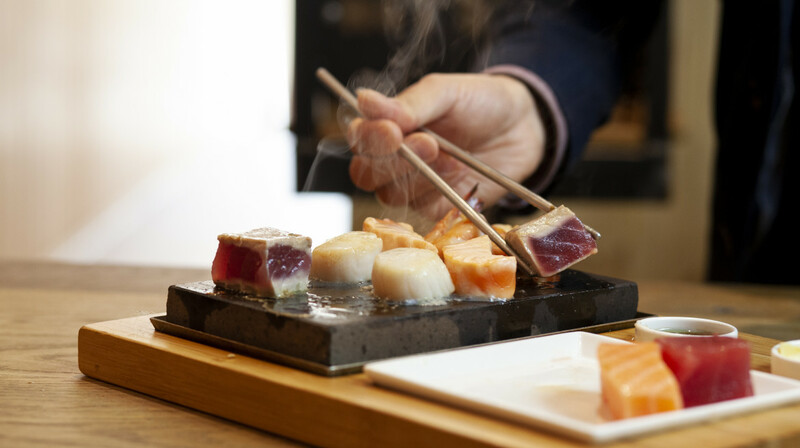 Hot stone cooking has been used across Asia for hundreds of years, and now you can try it yourself in the heart of Chapel’s Market, a short stroll from Angel tube. 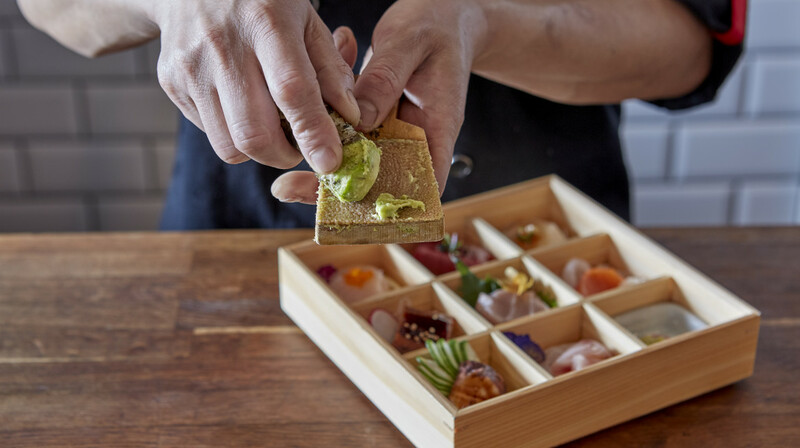 All hot stones arrive with butter and your choice of sauce, and you won’t want to miss out on flavour filled sides such as tangy kimchi and salad with zingy yuzu dressing. 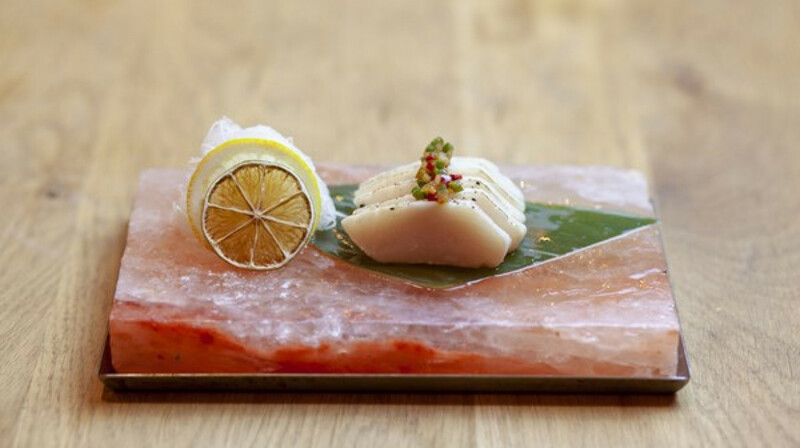 As well as hot stone plates, the restaurant offers all your favourite Japanese dishes. Enjoy stunningly fresh sushi, sashimi and maki hand rolls, as well as classic Korean comfort food bibimbap, served in a hot stone bowl so it carries on sizzling as you tuck in. Feeling thirsty? Take your pick from a fabulous selection of Japanese sakes, or opt for the sake flight to sample three and figure out which is your favourite. A global selection of wines is also on offer, making this the perfect spot for a sophisticated catch up with friends or quirky date night. Amazing we had the octopus carpaccio and a Chapel roll then a hot stone and nothing disappointed. One of the best Japanese restaurants in London. Super tasty and fresh food. Rich and intricate flavours. Good service. Highly recommended! We had the Scottish rib eye, seafood, the eel and foie gras rolls, the grilled aubergine and some seaweed salad. Everything was very fresh and tasted amazing. Service was quick and our waitress was very pleasant. Will definitely return. Delicious food and great service. The grilled aubergine and prawn Maki role we’re out favourites. Really great food that is beautifully presented, and staff were very friendly and helpful. I would definitely go back! Amazing night at Hot Stone. Would recommend the unagi tempura maki roll. Cooking our own food on the hot stone definitely added an element of fun over dinner - the seafood was absolutely fresh. Beautiful ambience with lovely team to craft your perfect night! Had the loveliest dinner last week at Hot Stone! Would 100% recommend and will definitely be going back. The food was really delicious and fresh, especially the sashimi and sushi rolls, so I thoroughly enjoyed the meal. They also had a nice range of sake which was a great accompaniment to the meal. Brilliant sushi with fantastic service. The soft shell crab was particularly amazing. We had a fantastic time at Hot Stone, the sushi was incredible and fresh. We were sitting by the bar and had fun interacting with the chef's all evening. Overall, we highly recommend this place! Excellent service, very professional staff. Hot Stone experience was highly entertaining but what we really fell in love with was Suzuki roll with seabass. All the ingredients are very fresh and the chief has magic abolity to transform them into wonderful experiences. Highly recommended, we’ll definitely come back again! Amazing food, amazing service. Some of the best sushi I’ve eaten. Fresh, well presented and tasty. 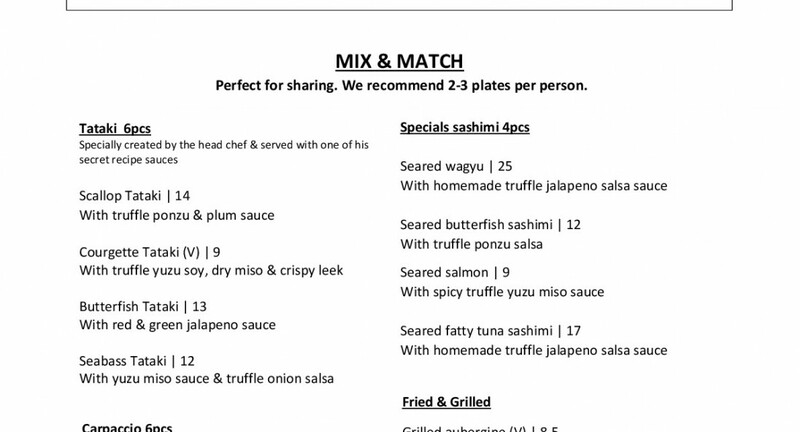 I’d definitely recommend the seared salmon sashimi. Going back again ASAP. Thanks to the chef who gave us free sake and a wagyu beef taster to celebrate the restaurant’s anniversary. The food and service were both very good. I loved the sushi rolls. I would definitely go back again. Best sushi my boyfriend and I have tried yet - and we have been to a lot of Japanese restaurants! All the dishes we had were extremely fresh, loved the fatty tuna sashimi and seared butterfish roll - very yummy. Would return. We had a great night at Hot Stone, the location is not too far from the tube and the restaurant is very pretty from the inside. Food wise we were really impressed with the quality, however unless you get sushi none of the dishes are very filling, yet delicious! The service is also very attentive and kind, so we would come back any time! We had a great dinner at Hot stone. The waitress explained to us about First Table offer the moment we sat down so there was no problem at all with using the voucher, which was really good. The service was fast and they constantly checked whether we were happy with the food. We had some rolls, the grilled aubergine and the black cod. I feel the rolls were more on the innovative side but were still delicious. The hot food however was authentic in proper Japanese style. The standard of the food was very high overall. Good delicious food, friendly staff, great evening. Awesome sushi and sashimi - some of the best we have tried (we’ve been to many sushi restaurants!). The hot stone experience was also very good. Great menu, great food, great service. Definitely will come back and recommend. Really cute little restaurant on Chapel Market. Sweet decor and nice staff. The food was really really good and the sushi definitely one of the best we’ve had around London. The courgette tataki with the truffle yuzu, though simple looking, was so flavoursome! We went for the special maki rolls - Suzuki (sea bass & pomegranate) and our favourite of the night the Crunchy Hot Stone roll made with king prawns and crunchy tempura flakes was way more than just your standard sushi! We ended with sharing a seafood mix hot stone which I was terrified of touching seeing as it’s heated to 400 degrees - but wow the fish cooked so well, and melted in our mouths. Definitely worth the experience and we look forward to coming back. High quality Japanese food. The sashimi was excellent. Unfortunately we slightly overcooked our sirloin on the hot stone—perhaps we should’ve asked them to cook it for us instead to ensure perfection. The sauce, however, was very good, as were the sauces with the sashimi. The restaurant is still pricey, even with half off, but that’s typical of high quality Japanese food everywhere, and I’m glad we got to try this great restaurant in our neighborhood. I’m not sure we’ll go back again soon because of how expensive it is, but we were definitely impressed and we enjoyed our time. The food was great the staff were friendly even though rather slow. The hot stone prawns and steak were of extremely high quality. Really liked the lighting and the cute wall covered in origami cherry blossoms. Would be a great place to take someone on a date to impress! We had a nice meal at Hot Stone and they were very accommodating when our friends were late for the reservation. The food was delicious and the service was good. I also liked the atmosphere of the restaurant which was very modern Japanese. I thought the menu was pricey and it ended up being an expensive meal even with the discount so I was glad we had booked through first table! 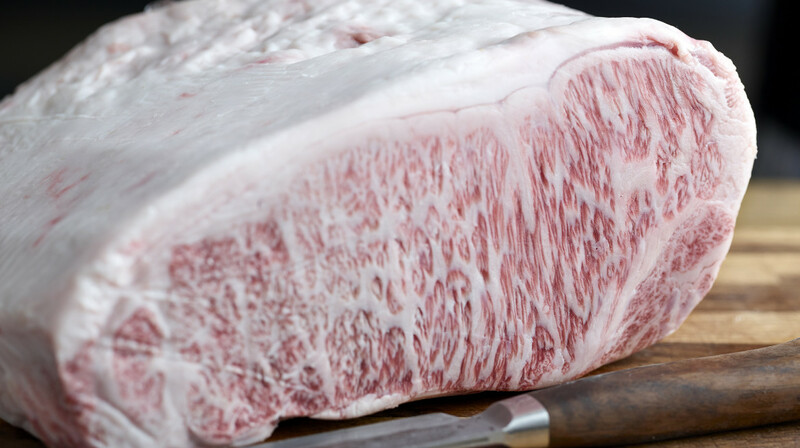 The deal doesn’t include anything wagyu which is a lot of the menu so it’s good to be aware of this before you book. Overall, a nice meal in a nice place. Staff are nice and the food is great! Such a great Experience and the food was amazing! Definitely recommend it! When I entered the restaurant everyone said hello, which was quite nice, and I was sat very quickly. We had a plate of sushi each to start which tasted amazing and a hot stone as our main. It was a cool experience cooking our steaks and prawns. Our waiter was friendly and offered help as we said we had not been there before. Overall a fun experience! I liked the experience of cooking your food on the hot stone however I wish there was more selection to make it into more of a 'meal' - plain rice or salad to go with it is just really bland! Was hoping to try their cheesecake but they had run out so keen to visit again to give it a go! Had an amazing dining experience at Hot Stone on a Saturday night. The service was so friendly and all of the staff made us feel really comfortable. I would recommend sitting by the bar as you can watch the chefs prepare the food. The food was delicious! We tried the chuka wakame (seaweed salad) which we had never had before but was so tasty. Would recommend the crunchy hot stone roles, crunchy eel roles and sushi platter. The mixed sea food hot stone was a lot of fun! Will definitely be back soon! Thank you Hot Stone for a great date night! Lovely restaurant, service was great and food was great. The octopus carpaccio in truffle sauce was amazing - definitely reccomend that dish! Hot Stone is a joy. We were cheerfully welcomed on arrival by the chefs in the open kitchen, and the service remained immaculate throughout. The kitchen was run with the precision of a military ship, their skill and the care taken over cleanliness and presentation clearly evident. You could be entertained for hours watching them at work! We were very impressed. The food? The food! Try everything, but don't you dare leave without ordering the crunchy Hot Stone roll. It's an opiate-like hit. 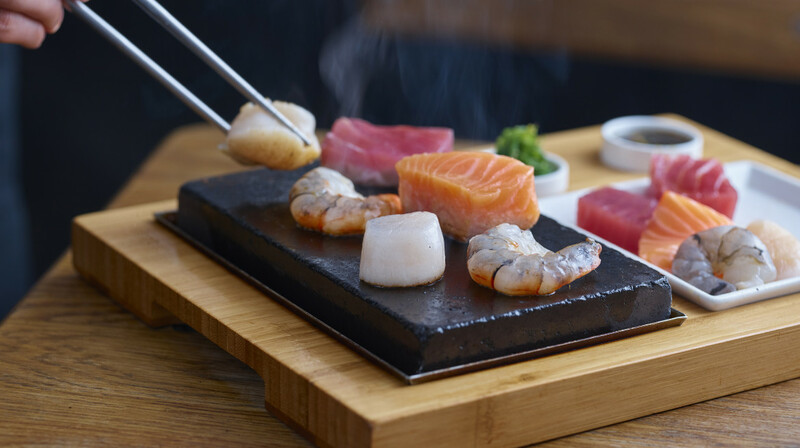 Or the main attraction: the steak and sashimi stone plate. Tender ruby slices you sizzle to DIY perfection. 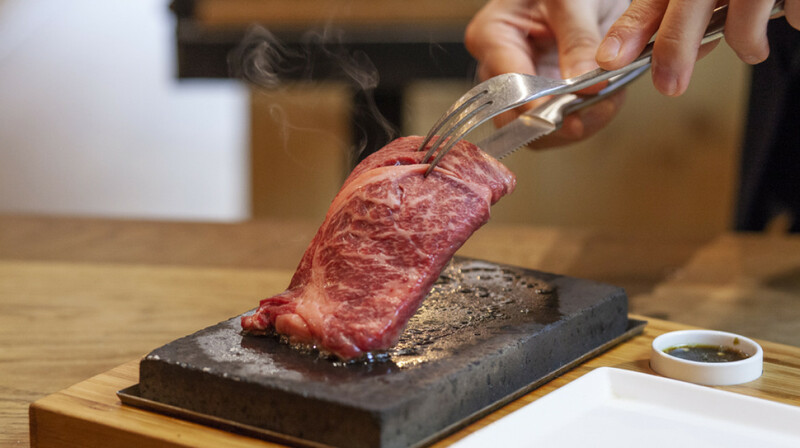 It's a lot of fun, so it's an ideal date or catch-up spot, but Hot Stone is more than just a concept restaurant; there is something extra special about the dining experience when cooking in this traditional Japanese way. But it's the heart and soul in the service that makes this place truly first class. The wagyu rolls and tatakis were delicious. Was a little disappointed by the hot stone to be honest... not as advertised on Instagram at all but the meat quality was still good. Overall we had a good meal and glad we went. 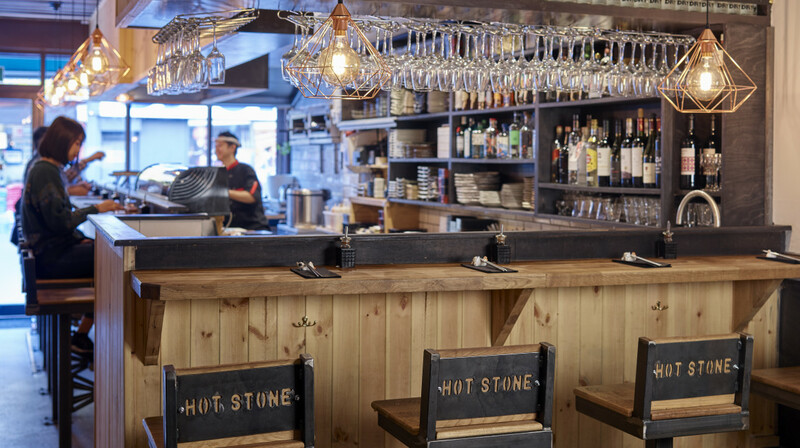 Hot Stone may be new to the Chapel Market but everything we received over the course of our meal came prepared by professional, experienced hands. The quality of the ingredients and the presentation was excellent. The space is classic Japanese, simple and elegant. A delicious meal. So glad we decided to try it out! Lovely Signature Dish, fresh tasty food, quick & polite service. The staff was very attentive, they greeted us cheerfully on our way in and out the restaurant. The grilled aubergine from the starters was a winner! We also got crispy sushi and the hot stone tuna and salmon, cooking them was a fun experience. I also liked the detail of different chopstick rests on each table. We will be coming back soon! We had an unbelievable time and a delicious meal throughout. Everything was perfection, and we received impeccable service, considering they knew we were on a dining deal. I cannot fault a single thing except being too full to eat any more of the incredible food! Excellent food and service! Me and my husband are Sushi lovers and so when we went there we order 4 different sushi platters, and they were excellent. We also tried the salmon tartare, and it was unforgettable experience. I do recommend this restaurant if you are looking for an authentic Japanese sushi. My girlfriend and I had an exceptional evening at Hot Stone. We were warmly greeted by their friendly chefs and wait staff. We enjoyed three starters, two mains and a dessert and each dish was delicious, and I can say it's the best Japanese we have tasted. Definitely plan to come back. 10/10! The location was excellent as it was just 5 minutes from Angel tube station. The restaurant was medium-sized, spacious and airy, and the sakura-themed decor was relaxing. They were playing the usual J-pop and K-pop music. The waiters were very attentive, giving an introduction to using the hot stone. The food was beautifully laid out and of course delicious. I'll definitely return to try the other dishes all of which look really good! Good food and attentive staff. Only slight issue is that some sushi had too much mayonnaise dressing on it. Brilliant little restaurant in an unexpected area. Sushi was lovely and great value for money. Got to try something new with the butterfish. We followed the sushi with the Hot Stone rump steak and fish platter. It’s a bit of fun and yummy :). Staff are lovely and helpful, will definitely return. The fish was all really good, but we could have used more instruction on the actual use of the hot stone. Suggested timings for each would have been helpful, the prawns were fairly straightforwards but how long to do the salmon/tuna was less obvious. Excellent food and service. Probably the best Japanese I've ever had in London.